Target targeted for contribution to anti-gay and anti-immigrant candidate Tom Emmer | Fight Back! 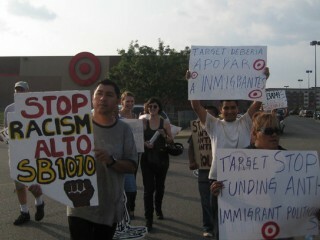 Minneapolis, MN - The outpouring of online anger at Target turned to the streets on Aug. 5, as more than 50 people protested outside of Target’s store on Lake Street and Hiawatha Avenue in the heart of Minneapolis’s Latino community. Target is under fire for contributing $150,000 to MN Forward for television ads in support of Minnesota Republican governor candidate Tom Emmer, a man infamous for his extreme anti-immigrant, anti-gay and anti-minimum wage views. 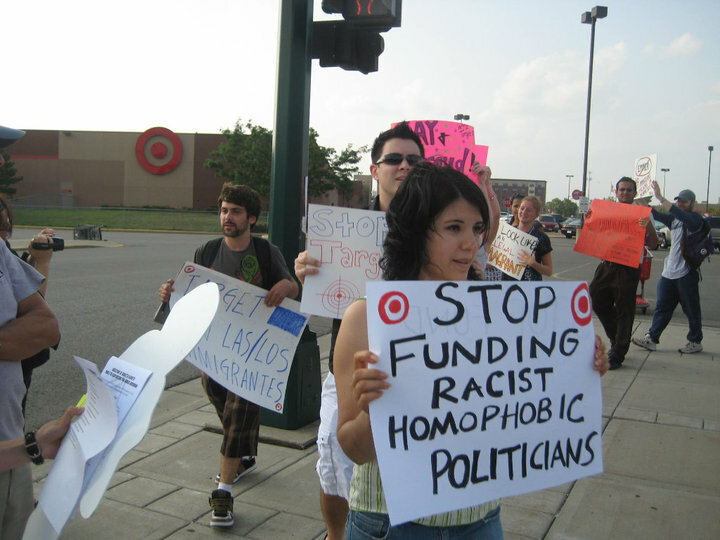 Outrage ensued when Target’s support for Emmer came to light last week. A Facebook group called “Boycott Target Until They Cease Funding Anti-Gay Politics” quickly amassed over 46,000 members and within days MoveOn.org collected more than 260,000 signatures against Target’s support of Emmer. 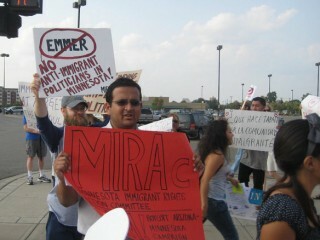 The Minnesota Immigrant Rights Action Committee (MIRAc) and the Boycott Arizona-MN (BAM!) campaign rallied numerous communities to protest outside the Lake Street Target store, all outraged at Emmer’s extreme right wing politics and at Target’s support of the candidate. Jennie Eisert of the Anti-War Committee spoke about the outrage toward Emmer and Target from the LGBTQ community. Emmer supports bills to deny domestic partner benefits to gay and lesbian couples and supports a constitutional amendment to ban gay marriage. Target is particularly vulnerable to criticism from the LGBTQ community, as they have spent years cultivating a gay-friendly image. Deb Konechne of the Welfare Rights Committee and Minnesota Coalition for a People’s Bailout spoke about Emmer’s long record of attacks on working class and poor people, which blew up in his face in the recent flap over Emmer’s proposal to lower the minimum wage and to cut wages for servers that get tips. Target’s large financial contribution to MN Forward is one of the first examples of the fallout from the U.S. Supreme Court’s 2009 ruling that allows corporations to give unrestricted money to political campaigns. Target’s CEO Gregg Steinhafel was unprepared for the whirlwind of anger from the LGBTQ community, immigrants and workers. As they spun into damage-control mode, Target initially said they were supporting Emmer because of his pro-business policies, not because of his social policies. Then under increasing pressure, on Aug. 5 Steinhafel issued an apology, saying he was sorry that gay Target employees felt offended by this. 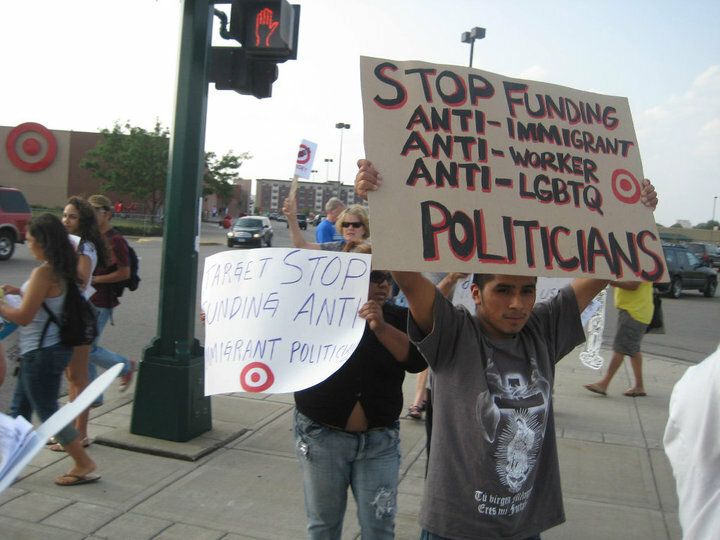 Organizers of the Thursday’s Target protest declared that the half-apology was not enough, because Steinhafel did not commit to stop funding for MN Forward or Emmer’s campaign and also only addressed the anger felt by the LGBTQ community, not by immigrants or workers.